What’s the most valuable and scarce resource in content marketing? It’s not money, equipment, or software. It’s attention. We’re all competing for our prospects’ and customers’ attention, which gets more scattered every day as new distractions keep on showing up on our screens. How do we capture this elusive attention? When in doubt, go back to basics. One of the most effective attention-getters ever is a simple joke. Even a sour-faced Scrooge must have laughed at jokes when he was a kid. The love of jokes is so universal that it seems to be hard-wired in our biology. Fashions in humor may change, but some jokes never do. They stay the same for generations. They were probably scratched on cave walls back in the Flintstone era. To the modern adult ear, these old jokes may seem corny, but you have to give them props for their staying power. Let’s put on our content-marketing-detective hats to uncover what makes these old jokes last so long. Then, let’s see what that can teach us about capturing and keeping our target audience’s attention. The joke catches our attention (at least the first time we hear it) because it violates our expectations. The joke teller’s voice and the context in which the joke is told indicate that the question is a setup for a punchline. The listeners wait expectantly for the punchline that will make them laugh. Instead, they get a matter-of-fact answer. This only works because both the joke teller and the listeners understand the setup-to-punchline structure of jokes. To a random Martian who had never heard a human joke before, it would just seem like a regular, if unnecessary, request for information. It’s only because we have internalized expectations that we can be surprised. The moral of the story: When planning or creating content, consider your audience members’ expectations. Then look for ways to surprise them. Knock knock. Who’s there? Banana. Banana Who? Knock knock. Who’s there? Banana. Banana Who? Knock knock. Who’s there? Orange. Orange Who? Orange you glad I didn’t say banana? Knock-knock jokes have probably been around as long as there have been doors to knock on. Admit it. You probably loved them when you were a kid. Hey, there’s a knock-knock joke for practically everything. Highly stylized patterns are comforting to kids (and adults!). They provide a framework of security. 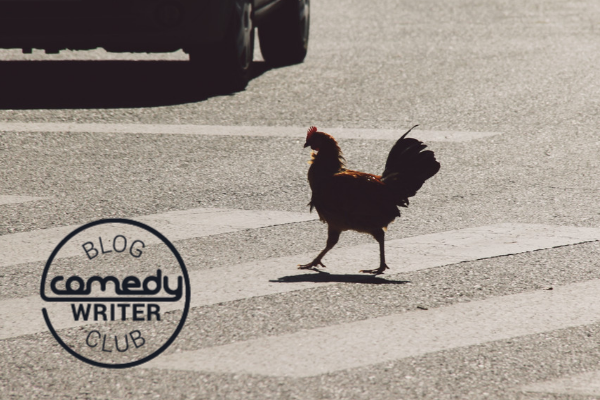 Our old friend from the chicken-crossing-the-road joke, the element of surprise, appears here in the punchline’s twist, but the bulk of the knock-knock joke is the repeated pattern. Telling and hearing these jokes is like acting out a familiar ritual. The moral of the story: Repetition is a powerful tool for content marketers. Make your audience feel comfortable by repeating key elements of your brand’s identity. Have a simple and memorable logo and tag line, and use them often. If you create a piece of content that becomes popular, consider turning it into a series. Adults may have outgrown their love of knock-knock jokes, but we never outgrow our attraction to familiar patterns. Create your own pattern, then draw people back by using it again. Orange you glad I didn’t say banana. A second lesson from knock-knock jokes is that puns have been popular throughout the ages (even if they sometimes make us groan). The moral of the story: Puns are a gentle way to introduce humor into content even for conservative clients like law firms that need to stay far away from controversial or biting humor. Can’t get enough puns? Don’t miss Puns in Marketing: The Good, The Bad and The Pugly. People love repeated patterns. Familiar structures make people feel comfortable and safe. Patterns and surprises go together like chickens and crossable roads. Capture people’s attention with a surprise, then keep them coming back by using familiar repeated patterns. One way to create familiar patterns in content is to follow the rules of writing for the web: Use simple language, short paragraphs, lots of white space, and keywords in headers. Create surprises by sometimes breaking those rules. For example, the usual practice in writing content is to avoid clever or punny headlines, instead writing headlines that signal clearly to web searchers what your content is about. Deliberately break that rule once in a while, and you might confound expectations and cut through the content clutter to grab people’s attention. Do you need help creating content that will capture your target audience’s attention? The Magic Eight Ball says WriterAccess is here to help!